The electrochemical instruments market is segmented on the basis of products, technologies, end user, and region. The global electrochemical instruments market was valued at $1,713.0 Million in 2014 and is poised to grow at a CAGR of 5.2% during the forecasted period. Factors such as Growing demand for multiparameter test instruments, and awareness amongst the people about the safe water consumption are driving the growth of this market. Moreover, emerging Asian markets, rising R&D expenditure of pharmaceutical and biotechnology companies globally, and global alliances amongst leading research institutes to trigger drug discovery to create huge opportunities for this market in coming years. However, commoditization of electrochemical instruments and declining average selling prices of electrochemical instruments are hindering the growth of this market. Some of the major players in the global electrochemical instruments include HANNA Instruments, Inc. (U.S.), Metrohm AG (Switzerland), Xylem Inc. (U.S.), METTLER-TOLEDO International, Inc. (U.S.), DKK TOA Corporation (Japan), Danaher Corporation (U.S.), Endress+Hauser AG (Switzerland), Thermo Fisher Scientific, Inc. (U.S.), Yokogawa Electric Corporation (Japan), and Horiba Ltd. (Japan), among others. Electrochemical instruments are used to measure and monitor various parameters such as pH, dissolved oxygen, conductivity, and concentration of various ions in the sample solution. Electrochemical instruments form an integral part of research laboratories across the globe and routinely employed instruments to monitor processes in biotechnology and pharmaceutical, environmental testing, agriculture and food and academic institutions. The global market is segmented on the basis of products, technologies, end users, and regions. Based on products, this market is categorized into electrochemical meters, titrators, ion chromatographs, potentiostats/galvanostats, and others. In 2014, the electrochemical meters segment accounted for a major share of the electrochemical instruments market, by product. On the basis of type, the electrochemical meters market is further segmented into benchtop meters and portable meters. In 2014, the benchtop meters accounted for the largest share of the electrochemical meters market. Based on technologies, the electrochemical instruments market is segmented into potentiometry, voltammetry, coulometry, and other technologies. Based on end users, this market is segmented into environmental testing industry, biotechnology and pharmaceutical industries, food and agriculture industries, academic and research institutes, and others. In 2014, the environmental testing industry segment accounted for the largest share of electrochemical instruments end user market. The key factors that are expected to spur the growth of this market are growing demand for multi-parameter test instruments, and awareness about the safe water consumption. Moreover, emerging Asian markets, rising R&D expenditure of pharmaceutical and biotechnology companies globally, and global alliances amongst leading research institutes to trigger drug discovery to create huge opportunities for this market in coming years. However, factors such as commoditization of electrochemical instruments and declining average selling prices of electrochemical instruments are likely to pose as a deterrent for the growth of this market. On the basis of regions, this market is classified into North America, Europe, Asia-Pacific, and the Rest of the World (RoW). Note: The size of the bubble chart depicts the market size ($Million) in 2014. 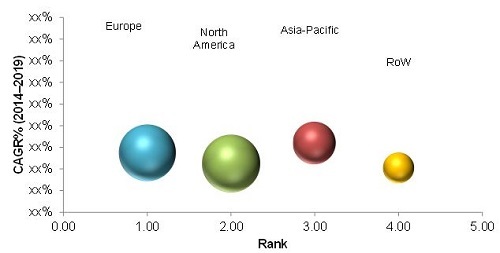 The global electrochemical instruments market is expected to reach $2,205.9 Million by 2019 from $1,713.0 Million in 2014, growing at a CAGR of 5.2% from 2014 to 2019. The market is dominated by Europe, followed by North America, Asia-Pacific, and the Rest of the World (RoW). Asia-Pacific region is expected to grow at the fastest rate during the forecast period. Some of the major players in the global market include HANNA Instruments, Inc. (U.S.), Metrohm AG (Switzerland), Xylem Inc. (U.S.), METTLER-TOLEDO International, Inc. (U.S.), DKK TOA Corporation (Japan), Danaher Corporation (U.S.), Endress+Hauser AG (Switzerland), Thermo Fisher Scientific, Inc. (U.S.), Yokogawa Electric Corporation (Japan), and Horiba Ltd. (Japan), among others. 10.2.1.2 Government Initiatives to Boost Research Activities in the U.S.
10.2.1.3 Increased Food Safety Activities in the U.S.
12.7 Thermo Fisher Scientific, Inc.
13.2.4 Thermo Fisher Scientific, Inc.